Eugene Laverty on the Milwaukee Aprilia at Phillip Island. Eugene Laverty may not have achieved the results he had hoped for at the opening round of the World Superbike Championship, but the Milwaukee Aprilia rider has taken plenty of heart from the potential he displayed at Phillip Island. Laverty was confident his team had made good progress with the RSV4-RF during the winter tests and his optimism proved justified as the Toomebridge man went third fastest during last Friday’s free practice. He improved further to seal second place on the grid in Superpole 2 alongside pole man Tom Sykes and double race winner Marco Melandri. However, an issue with his front Pirelli tyre thwarted Laverty’s chances in the opening race and he eventually finished in eighth place. 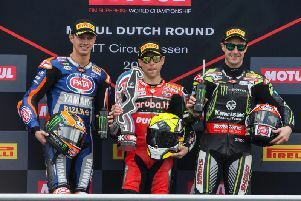 The 31-year-old made a flying start in race two and moved into the lead ahead of fellow Northern Ireland rider Jonathan Rea and began to open a gap at the front. However, disaster struck as Laverty was high-sided off his machine at Turn 6. He managed to return to the pits for new tyres and bodywork repairs and ventured back out onto the track, completing the race in 15th place to earn a single championship point. Laverty said: “The bike felt incredible and we were in the top three [in practice and qualifying], which is something that we didn’t manage last year. “Testing went very smoothly and we haven’t changed the parts on the bike all that much, we have kept everything quite constant and it’s been a matter of getting the weight balance right and working with what we have. “New parts don’t always mean you go faster, so we have kept everything the same and just got the best out of the package that we have,” he added. Despite his misfortune in Australia, Laverty said he now had a clearer indication of his potential. “We’ve got to be optimistic for round two at Chang [March 23-25] after the performance we’ve shown at Phillip Island.